There’s nothing quite like a relaxing vacation to a cabin in the middle of nowhere. For me, the bets part of this scenario is escaping from the everyday stresses in the big city. Unfortunately, cabin living can also have it’s own problems too, especially when one forgets to expect the unexpected. Gonna have a nice, relaxing weekend…I hope. 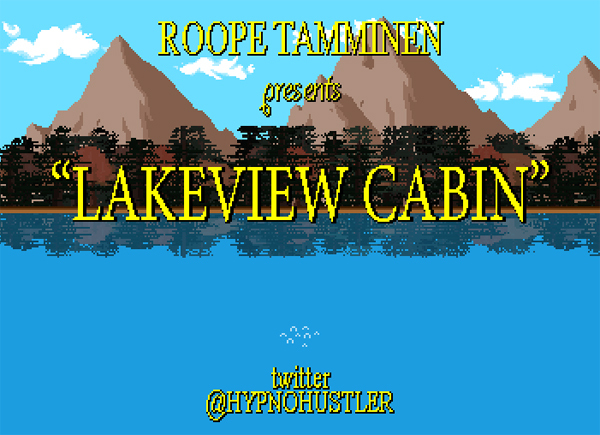 It’s really hard to describe Lakeview Cabin without spoiling the surprise, a surprise that caught me completely off guard and managed to make me smile from ear to ear. 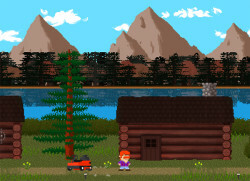 Essentially, the game starts out pleasantly enough with a red haired gentleman hanging out on a quaint little island in the middle of the lake. There are items lying about which you can pick up with “Z” and either throw or use them with “X.” Because of the type of items you run across, you begin to get the feeling that some sort of Home Alone type defense may be needed at some point in the future. With very little direction and even lighter narrative, you’re never really quite sure what, if anything is going to happen. I dug this game first for its simplicity and then because it allowed me to try and figure out everything on my own which is quite nice in today’s tutorial heavy gaming society. Don’t get me wrong, I was super confused, but that definitely added to the tension, especially when certain “things” started happening. I failed, I learned, I failed again and eventually got to the point where I almost, sort of knew what I was supposed to do though still struggled to actually do it when it needed to be done. Confused? I bet you are, but just play the game and you’ll know exactly why I’m being so mysterious. Happy Halloween!